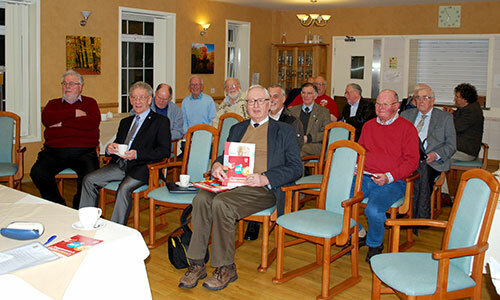 A successful meeting was held at the Tithebarn for the Ormskirk and Bootle Group Almoners. The meeting was also attended by the Provincial Grand Almoner Eric Hart MBE, the Ormskirk and Bootle Group Chairman Graham Chambers, the group pastoral care officer Derek Midgley, the group charity steward Malcolm Sandywell and the Tithebarn Manager Linda Johnson. 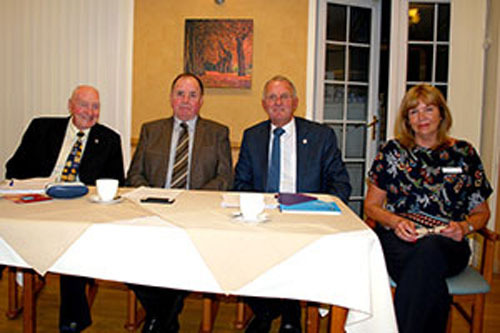 Pictured from left to right, are; Eric Hart MBE, Graham Chambers, Derek Midgley and Linda Johnson during the meeting. Derek welcomed everyone to the meeting and thanked Linda for hosting the event. He explained the purpose of the meeting and the opportunity to see the building and understand better the purpose, applications procedure and operation of the Tithebarn. After formal introductions and apologies, the new almoners were introduced and welcomed to their first almoners meeting. Derek then introduced Graham, who gave an interesting insight into the Friends of Tithebarn and the fundraising which goes on to provide valuable support for the extra items regularly needed by the home and assistance with day to day upkeep. Linda then gave an interesting explanation on the history of the Tithebarn and its function within the RMBI. She explained the purpose of the Tithebarn and how it operated. It had received top accolades and the staff were very highly trained. Whilst not providing nursing care there was a 10-bed specialist dementia unit, which was always in full occupancy. The applications criteria and procedure was explained and information was given to everyone to take away. Eddie Clarke, the group Tithebarn representative, then said a few words to the meeting about his experiences with the Friends of Tithebarn and the excellent work it did on behalf of the home. The Provincial Almoner Eric Hart gave an update on the care system and how the current applications procedure was being carried out. He encouraged almoners to look out for people in need and make applications to the MCF if assistance was required. He then thanked the current Ormskirk and Bootle Group Pastoral Care Officer Derek Midgley, who was shortly retiring, for all his efforts and hard work over the past years as the Local Care Officer and then the group PCO. The almoners at the meeting. Eric introduced the new PCO, John Thompson, who would be shortly taking over from Derek. John said he hoped to continue the good work as PCO for the group and looked forward to working with all the almoners and for their continued support. After a short question and answer session, Derek then summarised the current items directly affecting the group almoners and reminded them to continue visiting and maintain regular contact with widows and any sick or long term absent brethren. He hoped all the almoners had benefited from the meeting and appreciated their attendance at this his last meeting. He thanked them for their hard work and friendship over the past years. In concluding an enjoyable and interesting meeting Graham thanked everyone for attending and gave special thanks to Linda for hosting the meeting and Eric Hart for attending. He thanked Derek for his past efforts for the group and wished John well in his new role. After the meeting concluded almoners were given an opportunity to view the dementia wing at the Tithebarn.